When I first started blogging nearly 7 years ago (I can’t believe it’s been that long, by the way), I had no idea what I was doing. I knew how to write, but didn’t know what to do before or after posting. I didn’t run it like a business such as I do now. It was cathartic for me; a way to relax or to connect to other moms, or just to do what I loved to do, which was writing. I had no way of knowing that it would lead to a career for me. Or, that it would become my most favorite job ever. It’s amazing how much I’ve learned since I began 7 years ago, but it also reminds me that I have so much more to learn. The blogging world is a constantly evolving career choice, for sure, and I’m lucky to have a much better support system in friends who are also bloggers. Much more so than I did several years ago. We all need a little help now and then, no matter how long you’ve been blogging. I started thinking about what types of resources would have helped me when I first began. I’m a sucker for a good checklist, so I created two checklists for this post. The first is a checklist of items that I do before I hit ‘publish’ on any post I’m writing. The second is a schedule that I follow after posting to my site. Both are a sort of collection of things I’ve learned combined with a mixture of resources that I’ve had in my arsenal for a while. 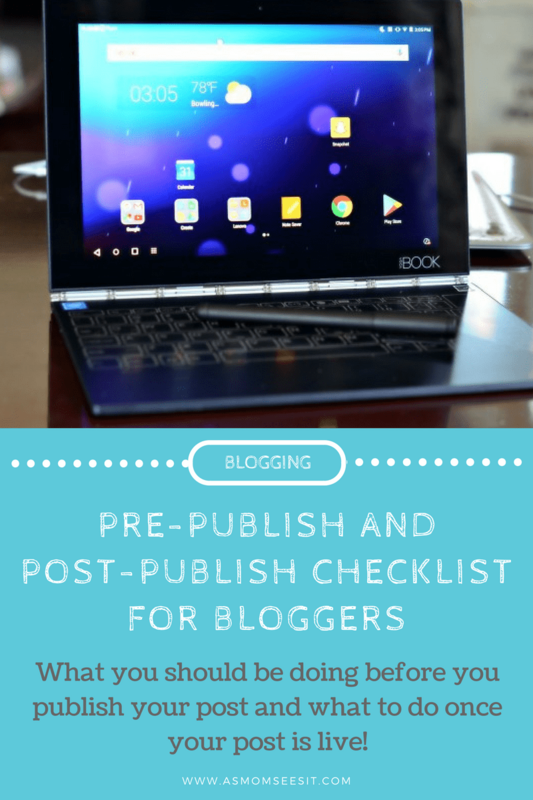 This checklist is not perfect, and I’m sure that other bloggers have completely different practices. But, this is the one that I’ve followed for some time and it’s worked well for me. It’s a great place to start and it’s perfect for keeping next to your computer as a listed reminder. Our pre-post checklist, the ultimate guide to what you should do before you publish your post, even includes ideal image sizes for social sharing, a reminder to include a disclosure, a reminder to link to other posts, and more. You can click on the image above for a full size, free printable to download and print. I love this checklist because for the longest time, I had no idea how to promote a blog post once it’s live. This checklist is a sort of schedule you can follow to socially promote your blog posts. I set it up using a combination of resources that I was using and needed them to be all on one sheet. Because each blog is different, which means your audience will be different from mine, it’s advisable to use your social media analytics to determine which type of headlines and at what times do best for you and your traffic. However, according to most websites’ opinions on when best to post to certain social media sites, this is a great beginning for a guideline to what you should do after posting to your blog. TIP: You can use the free Headline Analyzer to produce better headlines that will bring your post more traffic! What else do you do before you publish or after posting to your blog? Did you find these printable checklists helpful? How To Grow Your Site’s Traffic: Is Your SEO Working? Thanks for these awesome lists! I’m going to take these and add to them for my blog as well. I feel like I am always forgetting something.